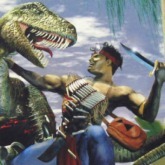 Description: In Turok you play as Tal'Set a Native American time traveling dinosaur hunter. In this primitive world has dinosaurs, savages and aliens that threaten your life. Armed with a Knife, Bow and a variety of guns you must take all evil out so the world in the future is at peace. The music and sound in Turok is great with primitive tunes. The gore graphics also feel high quality. This is a fun first person shooter overall with great platforming areas. A lot of running and jumping is very useful in areas of this game! Game Controls: Enter Key = Start Button. "E" Key = Jump. "Space Bar" Key = Use Weapon. "W,A,S,D" Keys = Look Directions. "I" Key = Move Forward. "L" Key = Move Back. "U" Key = Move Left. "O" Key = Move Right. "J" Key = Cycle Weapons. See In-game Controls to edit them, by clicking in-screen for more options.